Discover why Dublin in Ireland ranked #71 in our countdown of ‘100 Most Incredible Cities in the World’. Irish Whiskey, Guinness, U2, historic castles, the River Liffey and its 23 bridges, home to the craic! Yes, we’re talking about Dublin, a city full of character and characters, friendly locals who love a chat (if you can understand them), and an intriguing 1000-year-old history. In 2010 Dublin was named a UNESCO City of Literature for its synonymy with literary greats such as Samuel Beckett, Oscar Wilde and James Joyce. It is said that some of their best works were dreamt up while they were drinking in Dublin’s watering holes – and you can visit these establishments with Dublin Literary Pub Crawl. 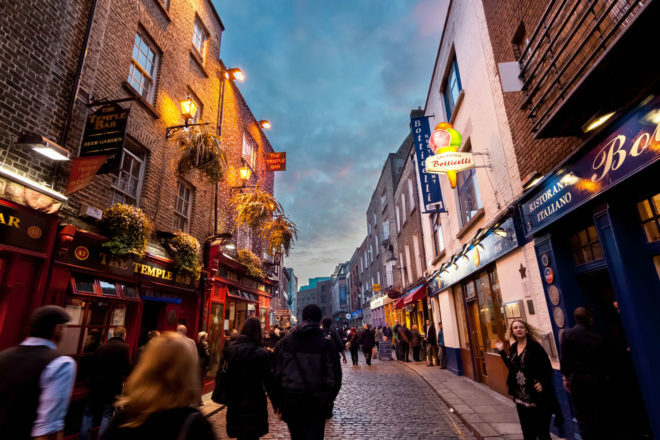 The tour, which includes professional actors performing the works of Dublin’s most famous writers between pints, was ranked No.4 in The Sunday Times (UK) world’s 50 best walks.